For years Hartland Veterinary Clinic has provided the most outstanding quality care to the animals in Woodstock, IL and the surrounding communities. Our friendly and compassionate staff treats every pet that enters our office as if they were their own. As a home-town clinic, we provide all of our service with care and love, while never forgetting a name, face or paw. 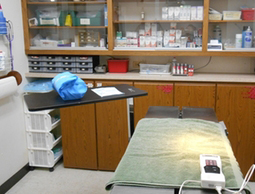 In addition, our clinic utilizes state-of-the-art equipment to ensure the health and wellness of the animals, from preventative medicine to treating serious medical problems. We sincerely care about the health of your pet and will do everything to keep your best friend by your side for years to come. For veterinary care you can trust your furry family members to, come to Hartland Veterinary Clinic today! 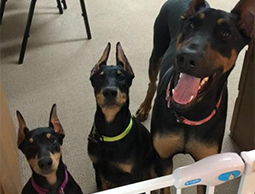 In June 2014, Dr. Shawn Costello and Dr. Shannon Moore purchased Hartland Veterinary Clinic to provide exceptional care and veterinary services to all of their patients. Our staff is truly dedicated to our patients and will do everything in our power to ensure they lead a long and happy life, including following up with them to see how they are doing after check-ups and procedures. Dr. Shannon Moore grew up in Woodstock, IL and started working for Dr. Shawn Costello and Dr. Charles Svoboda when she was 16 at Harvard Veterinary Clinic. She decided to become a veterinarian after the encouragement of Dr. Shawn and Dr. Chuck. She received her undergraduate degree in 2007 and graduated with her veterinary degree in 2011 from the University of Illinois at Urbana Champaign. It was truly a dream come true when she had the opportunity to purchase Hartland Veterinary Clinic in 2014 with Dr Shawn and Dr.Chuck. She has a passion for internal medicine, a soft spot for Doberman Pinschers, and is extremely devoted to her patients. In her free time, Dr. Shannon loves spending time with her husband, Nick Moore, and her dog, Dump Truck, who comes with her every day to the office. Dr. Shawn Costello grew up in Woodstock, IL and has been practicing veterinary medicine since he graduated from the University of Illinois at Urbana Champaign in 1986. Along with Hartland Veterinary Clinic, Dr. Shawn also is co-owner of Harvard Veterinary Clinic in Harvard, IL. Dr. Shawn loves both soft tissue and orthopedic surgery, and enjoys being able to work with animals every single day. When he is not working, he loves to run out in his pasture with his “Jack Russell terrorists” and spend time with his 7 year old daughter, Catie. He also enjoys traveling, hiking in the wilderness, and photography. Amanda started out in 2003 as a veterinary assistant working with her Bobsie twin Shannon for Dr. Shawn at the Harvard Veterinary Clinic. She worked many years in small & large animal medicine to become a veterinary technician with special interest in inpatient care, surgery and dentistry. She is happy to be reunited with both again at the Hartland Veterinary Clinic. She enjoys horseback riding and vacationing at her family’s lake house in Wisconsin. She has many fur babies including 2 small dogs named Roxy and Dolly, chickens, 4 horses and a goat. Ashley found her career passion in working with animals big and small when she started working for Dr. Shawn and Dr. Chuck at the Harvard Veterinary Clinic in 2006. Harvard is where she first met Dr. Shannon (a fellow vet assistant at the time) and is thrilled to be working with her once again. She has two dogs and two cats; no one should be left home alone; and would love to one day have a whole menagerie. Her favorite part of working at a veterinary clinic is that making animals feel special and cared for is in the job description! When she isn’t spending time with her son, she enjoys watching movies, traveling, and shoe shopping. Ashley is also an avid sports fan and her favorite sport is hockey. Bridgette grew up in Harvard, IL with a love of everything furry & 4-legged. She currently has three cats named: Mittens, Garfield & Ladybug – named for her obsession of collecting anything with ladybugs. She has worked for Dr. Costello & Dr. Svoboda at the Harvard Veterinary Clinic since 2012. Since beginning her work there has found the world of animal care absolutely fulfilling. She just recently joined the Hartland team, which she is finding to be quite a fun change up in routine. Bridgette’s passion for animals keeps her plenty busy, not only working in the office but also handling the kennel at the Harvard facility. When not working at either clinic, Bridgette also spends her time working with the Harvard Fire Protection District & Royal Oak Farm Orchard. On the rare occasion that she is not at work, she can be found spending her time reading, cooking (eating), enjoying time with friends & family, and cheering on her beloved sports teams (Chicago Bears & Chicago Cubs). Cheryl has been working in veterinary medicine at Hartland Veterinary Clinic since 1998 starting for Dr. Genge and now working for Dr. Shannon and Dr. Shawn. She has handled various animals over the years including alpacas, a kangaroo, and various fur babies. She has lived in this area since 1991 with her husband and 2 dogs named MoJo and Sammy as well as 2 blue connor birds. Cheryl loves all sorts of animals and is our kennel manager that makes sure your pet is comfortable during their boarding stay. She is busy outside of work with her 5 children and 14 grandchildren, whom she loves to see very much. She is also an avid gardener and enjoys caring for her pond feeding the fish. At Hartland Veterinary Clinic, we strive to bring your pet the best veterinary care possible, specializing in small animals, particularly dogs and cats. Our wide variety of services will help keep your animal happy and healthy! To better care for the furry members of your family, we have prescription diet food, a fully stocked pharmacy, and advanced diagnostic capabilities and equipment, all in-house at our location. 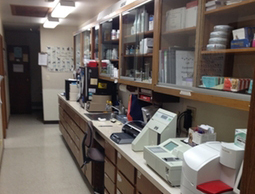 With our equipment we are able to have diagnostic results in minutes to better serve our patients. For those serious situations, we also have a full surgery suite prepared to cover a range of procedures from routine spays and neuters to soft tissue surgeries and tumor removals. We are fully trained and equipped to handle all of your pet's need. 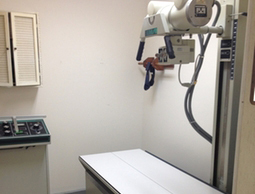 Hartland Veterinary Clinic provides quailty X-rays conveniently onsite. From routine surgeries like spays and neuters to more advanced techniques such as bladder stone removal and orthopedic procedures, our state-of-the-art surgery suite allows us to safely monitor patients during surgical procedures. At Hartland Veterinary Clinic we carry the pet products you need to maintain your pet's good health. Whether it's a pet prescription for a one-time illness, or a special diet for ongoing pet health condition, we will happily provide it at our veterinary clinic. We are happy to care for your beloved pet while you are away. Cats and dogs all shapes and sizes are welcome to stay here at the clinic. We have spacious runs and cages, we provide the blankets and feeding dishes. The clinic feeds science diet sensitive stomach for our boarders, clients are also welcome to bring in the pets current diet for us to feed. Pets with special needs are treated with the respect and kindness that they deserve. Pets with medications will be on a written schedule and given medications at no additional cost. Long walks and lots of hugs and kisses are given to your pet while they stay at the Hartland Veterinary Clinic. For more information about our services or questions about treatment options for your pet, feel free to contact us today. We look forward to hearing from you! I have been told my pet needs its teeth cleaned regularly. How important is that? Very important! The tartar and staining on your pet’s teeth actually contains bacteria. If this is left untreated, it can cause premature periodontal disease, heart disease, liver disease and kidney failure. Dental care for your pet is very important for a long, healthy life. Heartworms are parasites that dogs and cats can get from mosquito bites. The mosquito bites them, depositing larvae that migrate to the heart where they become adults. Despite fur, mosquitoes can still bite dogs and cats and transmit the disease. It is important to have yearly heartworm testing and keep them on a monthly preventative at home. My pet needs to have surgery, but I am concerned about anesthesia. There is always a risk with anesthesia, however, that risk is minimal if appropriate steps are taken before and during surgery. A thorough physical examination will be done to make sure there are no apparent abnormalities, and if there are, we will discuss better treatment protocols for your pet prior to anesthesia. We also offer in-house preoperative bloodwork. In addition, during any procedure in which anesthesia is administered, a technician will monitor your pet. We know how important your pet is to you, and we are here to always deliver the best care for them. If you have any questions about your pet's health or our practice, feel free to contact us today, or fill out the following information and someone will be in contact with you shortly!